WHITEHALL, Mich. — What started out as a simple passion for a Michigan man ended up evolving into a pilgrimage as his love for the blues is making sure some of the country's greatest musicians will never be forgotten. Many blues artists died before any of their music earned any money, which means several of the nation’s greatest blues artists are buried in small towns and cow pastures in unmarked graves. “It’s something I never envisioned doing,” said Salter, who says he’s been a true lover of blues music his entire life, and has a lifetime of blues memorabilia to prove it. He’s transformed his garage into a shrine of blues collectibles. All four walls are layered with treasures he’s collected, photos of famous blues artists, hundreds of records and autographs. He even built a mini stage in the garage, complete with microphones and guitars. This blues sanctuary isn’t just a place to house his collection. It’s also the place where Salter goes to work. Salter’s research into these musicians is deep and thorough. In 1997, Salter drove to New Orleans for a big blues festival. During the trip, he said, he made a point of stopping at cemeteries to visit graves of famous blues artists because he wanted to pay his respects. On his way south, he stopped in Chicago where many blues artists are buried. “The first grave I went to was Muddy Waters, and I was surprised to see that he only had a small stone,” Salter said. “The gravestone was only one foot by two foot. 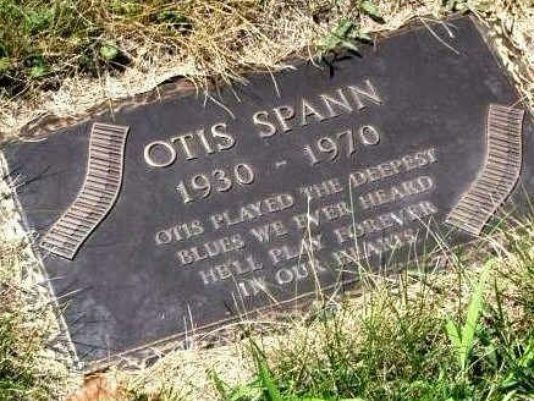 Salter left that cemetery and decided to visit another one in the Chicago area in search of the gravesite for Otis Spann, who happened to be Waters’ piano player, and was a huge influence in the blues industry. “I arrived at the cemetery, walked out to the plot where Otis Spann was buried, and all I saw was grass,” he said. “There was no grave marker. The lack of a gravestone for Spann never left him during that trip. “When I got back from New Orleans, I decided to contact a prominent blues review magazine, wrote them a letter to notify them that Otis Spann is laying in an unmarked grave, and something should be done,” Salter said. Through the backing of the magazine — which published a story — a fund was launched and people from all over the world donated money. A marked gravestone was eventually placed for Spann, thanks to Salter's letter to the magazine. “Through my research, I had found so many other blues artists who were also laying in unmarked graves, but the magazine didn’t seem to have any further interest in helping. In 2009, Salter, along with four others, gained 501(c)(3) non-profit status for the Killer Blues Headstone Project. Salter and his group have placed gravestones in 12 different states: California, Georgia, Illinois, Indiana, Louisiana, Massachusetts, Michigan, Mississippi, Missouri, North Carolina, Pennsylvania and Texas. If the finished stones are delivered to Salter’s home in Whitehall, he will travel to the state where the artist is buried and place the markers himself. Most of the time, the stones are made by a monument company in the city where the musicians are buried. “If we can’t travel the long distance ourselves, we ask the cemetery sextons to place the gravestones, and once they’re officially on the ground, they take a photo, send it to us, and then we cross that artist off our list,” Salter said. Killer Blues Headstone Project has recently discovered more than 50 additional blues musicians’ gravesites that are unmarked. The plan is to place a stone for each one, but the organization relies exclusively on financial donations to make that happen. Donations can be made at their website. “The reason I do this is to honor these individuals who brought such great music to the world,” Salter said. “It makes me feel good when we get a stone down on the ground. Ashcroft, Brent. "Man Honors Blues Artists One Grave at a Time." Standard-Times. Accessed August 22, 2016. http://www.gosanangelo.com/entertainment/music/390478331.xhtml.